The State Department announced Thursday it was calling back nearly all staff next week and paying them for a two-week period, but a growing number of U.S. diplomats are frustrated by the partial government shutdown and the damage it’s inflicting on their jobs and America’s standing abroad. Amid an eight-country tour of the Middle East, Secretary of State Mike Pompeo sought to assure his department’s rank and file serving at missions overseas and working to support his trip while not being paid because of the government shutdown. “We’re doing our best to make sure it doesn’t impact our diplomacy,” Pompeo said of the shutdown while in Abu Dhabi on Saturday. While the plan to pay staffers has changed for the next two weeks, the uncertainty of what could come after that -- if the shutdown continues for that long -- has unnerved diplomats and their foreign counterparts. “It is an embarrassment to the country. I have had multiple [foreign counterpart] contacts asking how does this happen in the U.S.,” said another Foreign Service officer. Approximately 23 percent of U.S. employees overseas and 40 percent in the U.S. have been furloughed, according to a State Department spokesperson. But because of the shutdown, employees have been limited in their ability to meet with foreign counterparts or provide assistance to U.S. companies working in their host country. They’ve been forced to cancel or decline invitations to events or meetings. “You don’t sort of put diplomacy on hold, and I think that we’re going to look back at this period with a lot of regret for sort of missed opportunities,” said the diplomat based in Europe. That’s because the department is forced to prioritize “the protection of the United States’ critical national security interests and the safety of U.S. citizens abroad” over other functions, according to the spokesperson, who is among those still working but without pay. Even with the new pot of funding for salaries, department activity will be limited to this scope, with limits on employee travel and engagement. That pay will also only run for the next two weeks before the department will have to consult with Congress on moving additional funds to cover salaries. In addition, employees will not yet be paid for the first month of the shutdown -- until fiscal year 2019 appropriations are approved and back pay can kick in. "It has become clear as the lapse has continued to historic lengths that we need our full team to address the myriad critical issues requiring U.S. leadership around the globe and to fulfill our commitments to the American people," a State Department spokesperson told ABC News. "We are also deeply concerned about growing financial hardship and uncertainty affecting Department employees whose salaries and well-being are affected by the unprecedented length of the lapse." Even amid the shutdown, staff had to support Pompeo’s week-long Middle East tour while not being paid -- a trip that required more staff than usual to work for his wife Susan, who traveled with him and had her own schedule of meetings and activities. 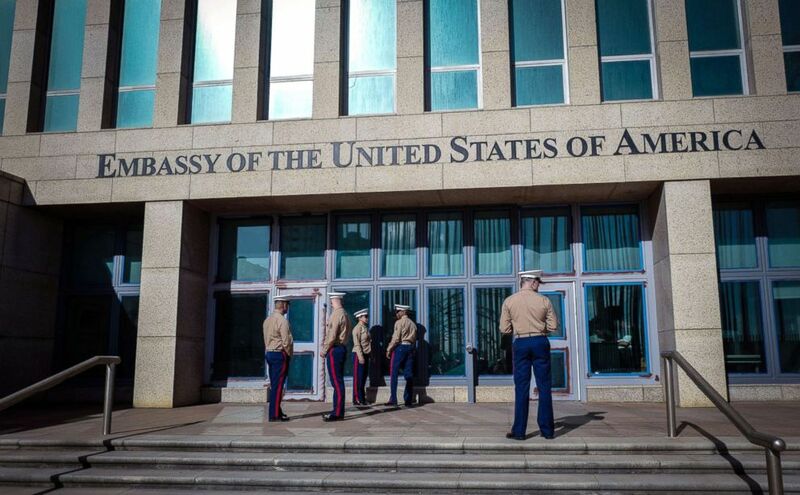 The secretary said his wife was on "an important mission ... trying to help the State Department be better" by touring embassy facilities and living conditions and making recommendations for improvements. 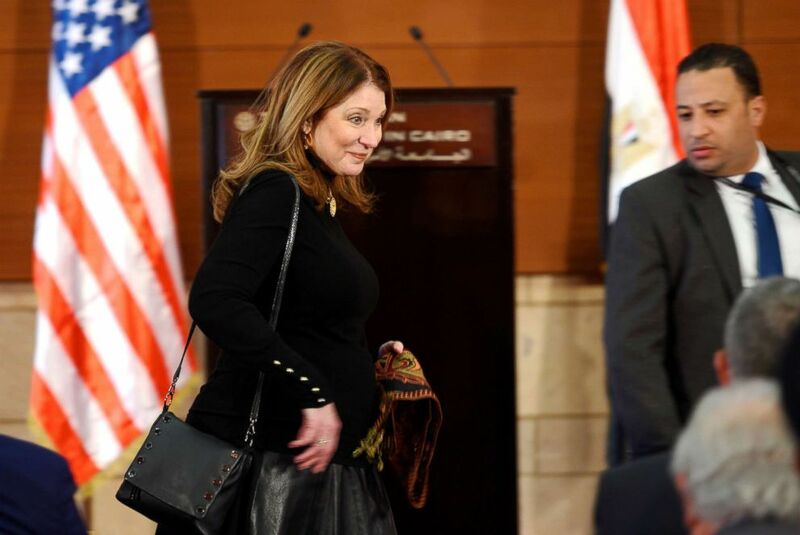 Susan Pompeo arrives to listen to her husband U.S. Secretary of State Mike Pompeo speaking to students at the American University in Cairo, Jan. 10, 2019. Consular operations like visa and passport services have remained open because they are supported by the fees folks pay for them, but some could be at risk of closing or scaling back hours if they do not have sufficient fees. Certain operations within the agency have also remained open because of residual funds, including Diplomatic Security, Overseas Buildings Operations, and International Narcotics and Law Enforcement. Diplomats sometimes spend a year in language training ahead of a new posting, but those classes have also halted -- even though diplomats will ship out to post at the same time. That means they will be less prepared when their position starts later this year. While some federal employees in the U.S. have turned to side gigs, those based at U.S. missions abroad are not allowed to do so. The shutdown could also start to pose a security risk, some have warned. “We have tens, if not thousands of USG [U.S. government] employees with security clearances not getting a paycheck. Can only imagine that the Russians, Chinese and others are licking their lips at the prospect of there being a lot of people in need of cash,” said one U.S. diplomat based in Eastern Europe. “USG employees are so incredibly dedicated and patriotic, and here our own government is putting them in a precarious situation,” they added. Department employees are expected to receive back pay after the shutdown ends. One U.S. diplomat quipped that even quitting would be difficult because the shutdown means that there is no one working to fund moving families home -- something guaranteed to all diplomats. ABC News' Scott Withers contributed to this report.